This was a fun page to do that seemed to come out rather quickly. I like the scene transition here with the use of the TV, something we did (in a more simplistic way) in the original comic books at least once or twice. And I believe those were about the Lone Wolf as well. A lot of build and hype for everyone’s favorite insane, arrogant masked man. And I think it’s working. It’s getting me excited, and I know what is going to happen! I had some fun creating the set and host for the talk show, as there really wasn’t any description written. The set design has a nice abstract retro look. Do any of you recognize it? It’s based on Arsenio Hall’s old set, which I found very visually interesting and unique. I studied several sets…most were boring. The host is not based on Arsenio Hall though. And if you were wondering, no I was not a fan of Arsenio Hall. I was pretty young when his show was prominent, so I didn’t even really ever watch it and was barely aware of him. The host is based on a real Detroit public television host who I found through on the net through articles featuring people who were upset over his being fired. Oh Detroit, always controversial. 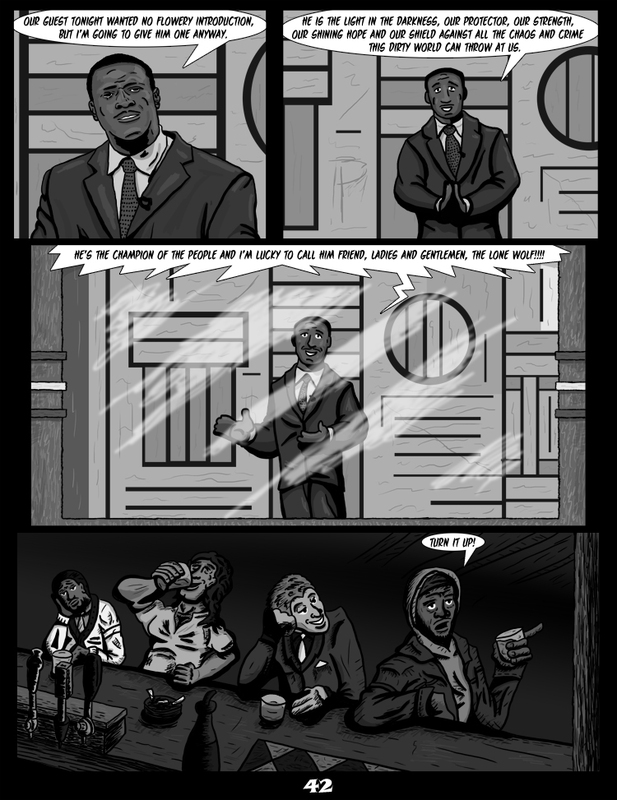 And yes, I specifically wanted to make him a black host, in my continuing efforts to give the comic some ethnic authenticity. Alex and I tend to think in terms of movies, even when writing, and this pull out shot from the TV to the bar is an example of that. I think the deliberate pacing of the story is also a nice example of that. And in case you weren’t aware, I was a film major in college and took several screen writing classes, and Alex and I have shot many short films, in addition to being paid to make commercials. So we know a little something about the subject. It’s nice to return to the bar here. As the TDM name would imply the bar is supposed to be pretty important, and may be considered our main location. It certainly is in a lot of the story, as it was in the original comic books. It’s even more central this time around though. And I won’t say more about it than that. I really like how dynamic the characters look sitting here as I’ve applied some more of that dramatic shading to create some atmosphere. It is fun to be able to continually evolve my style and see it change throughout the story, in conjunction with the shifts in tone. Not too continually bring up the original comic books, but that was true of them as well, and in a fairly meaningful way. Things are meant to start out a bit lightly then continually grow darker. So let’s see what I can do with a bar scene this time around.